A 5th year high school student has created his very own wirelessly controlled robotic hand that has been powered using the Arduino programming platform. 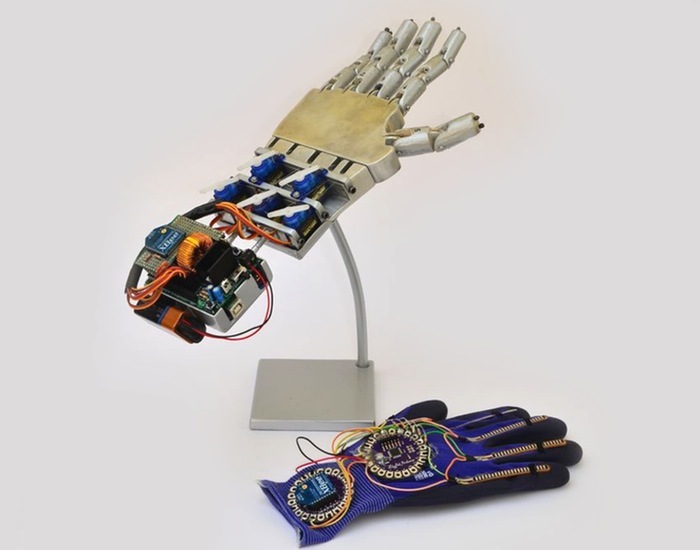 The wireless robotic hand has been created to reproduce the movements of a glove worn on another hand. The system is still currently under development but shows great use of the platform and components, check out the robotic hand in the video after the jump. Then wireless robotic hand control system uses 5 flex sensors, a Lilypad Arduino board a Arduino Uno and 5 servomotors. For more information on the project created by Instructables user Gabry295 jump over to the Instructables website for details. The Arduino platform uses a single-board micro controller, designed to make the application of interactive objects or environments more accessible to developers, hobbyists and makers. The Arduino Uno board is open source hardware and is designed around an 8-bit Atmel AVR microcontroller, or a 32-bit AtmelARM. The Arduino Uno development board consists for 6 analog input pins, as well as 14 digital I/O pins. Earlier this year the Arduino platform announced the launch of their new Arduino Zero development board, more detail of which can be found in out earlier article.